Drums! is a 99-cent drum-playing app for the iPad/iPhone/iPod Touch. Unlike GarageBand, there’s no learning curve here, just pound away. 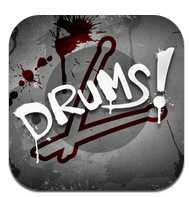 A similar app called Drums HD is free for Android phones and tablets.